Whether you are decorating a purchased board for a special purpose or gift or making one from scratch, this is a fun and easy project to do at home. 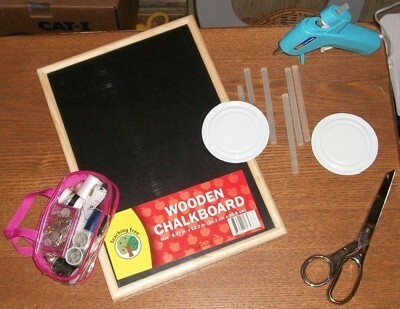 This is a guide about making a chalkboard. 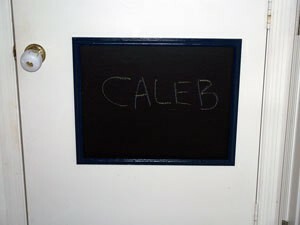 I took a Dollar Tree chalkboard and made it into a decorative board for your sewing room. Lay the board on a flat surface and start gluing the tape from left to right. Cut the end of the tape where it runs out of board. Turn the board with the glued measure to the left, and do it down the side. Keep doing this till the board is framed in the tape. My Mistake: I overlapped the tape on each corner, but if I were you, I would miter the corners so they are not so thick. I crocheted a little pin cushion on the top, but you can use a needle fob or something similar. Hot glue the can lid to the center or any place you want it. 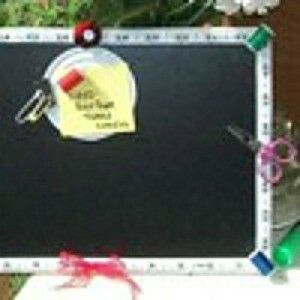 This is your 'Memo Board' so you can put notes up. With the magnet pieces, glue some to the spools for magnets on the metal. I also glued a magnet to the metal so I could keep pins, needles, etc. together. I then just hot glued some cute things to the frame, keeping the sewing theme going. This makes a nice gift for a crafter, and is less than $2.00-3.00 to make. They come with hooks on the back, so make sure the hook to hang it with is up when you start to decorate or you will have to do like I did and make my own hook. 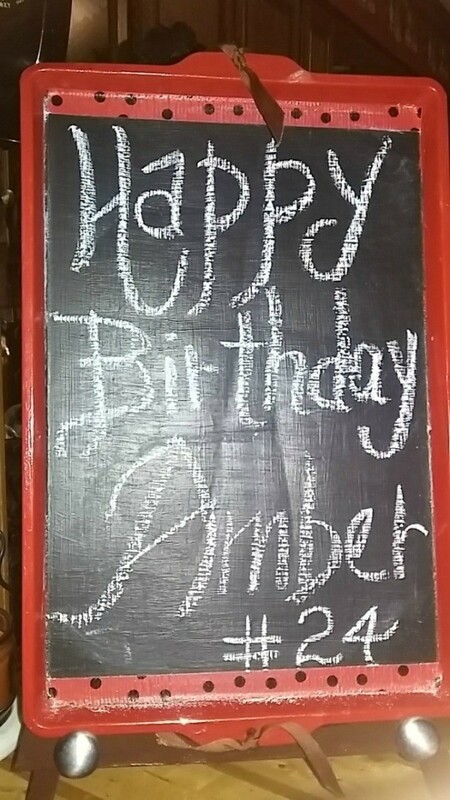 I took an old baking pan and painted it with chalkboard paint. Then I painted the handles that have holes and around the edge with a nice red color. I tied a pretty ribbon out through the holes and used whimsical tape to make a border at the top and bottom. Sand baking pan, make sure it is dust free. Paint with chalkboard paint, allow to dry, apply 2 coats. Paint handles with paint of your choice, allow to dry. Apply duct tape to decorate. Tie decorative ribbon through the hole in the handles. Write a message on it with chalk. Place on an easel of your choice or hang it on your wall. I spray painted an old photo frame. Traced the inside on my kitchen door. Painted the space with black chalkboard paint and attached the frame with high quality glue. 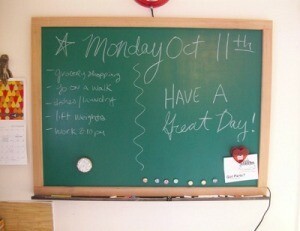 You can make a chalkboard to fit any size of frame. Just take a thin, smooth board (smooth plywood works well for this), cut to the desired size and paint it with dark primer. Let that dry and spray paint it with chalkboard paint, which you can buy at your local hardware store. 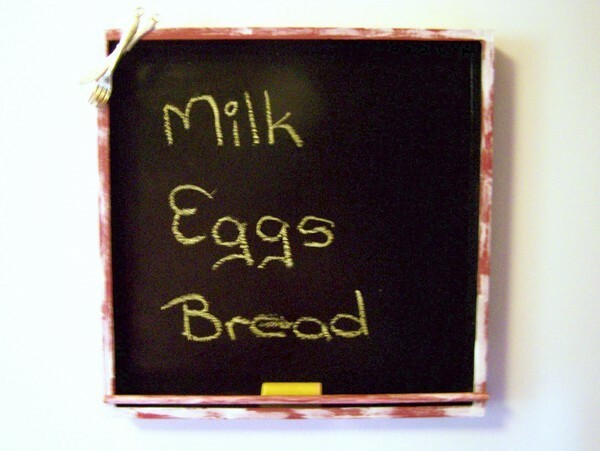 Use special paint on a flat surface to create this easy chalkboard. This is a guide about making a magnetic chalk board.